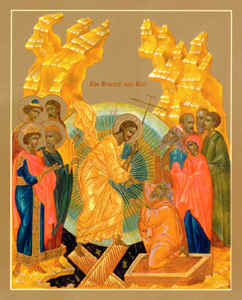 St. Innocent Orthodox Church - What is the Transfiguration? Jane M. deVyver, M.A., M.Th., Ph.D. This article is written in a more 'formal' style than the other articles on our site. It is a chapter in a lengthy study of the symbolism of the skéné, entitled: "The Skéné — A Universal Symbol of the Divine Presence: Perspectives on the Form and Function of a Symbol." We have added eleven icons to illustrate what is being said in the essay. The Transfiguration of Christ is a rather neglected (especially in the Western Church) and often, little understood event in the life of Christ, and a major feast in the life of the Church. Indeed, the more one examines the Transfiguration, the more its complexity is revealed. Yet, much may be gained by pursuing its complexity, and by seeking to better decipher the meaning of so significant an event, because it is basic to the theology of the Incarnation and Resurrection, to the theology of icons, and to the theology of Christian spirituality. To that end, this study will consider a few aspects of the Old Testament Presence in this New Testament event. Let us first consider St. Peter’s response to witnessing Christ’s Transfiguration. Why should Peter's response be to build a skéné, and what type of skéné might he have had in mind? Most likely he did not intend any type of tent in which a person might literally dwell. But could he have meant three grass and twig huts such as are used at the Feast of Tabernacles? Perhaps his was a natural response of wishing to commemorate a theophany by creating some type of memorial associated linguistically, and therefore, symbolically, with the Holy of Holies in Jerusalem where God’s Holy Presence, His Shekhinah, dwelt. It seems to be a universal human experience throughout history that people have wished to build some sort of memorial chapel or shrine to commemorate a sacred event—a theophany or a miracle. A second basic question about the accounts of the Transfiguration is, of all the Old Testament prophets and saints, why was it Elias and Moses who appeared with Christ? What is the significance of the appearance of these two prophets, and might they be involved in some way with the experience of the Shekhinah? Could the answers to these two questions also explain St. Peter's impulse to create three skénai to commemorate the Shekhinah? We suggest that indeed, there is an important relationship, as shall be explained. Some Protestant interpreters accept the synoptic Gospels’ accounts of the Transfiguration as historically factual. Others discount any objective historicity and argue for a totally symbolic treatment. Still others consider it as a post-resurrection event that was transposed to an earlier place in the Gospels. The Interpreters Dictionary proposes that it "was a visionary moment that revealed to the disciples Jesus’ true nature (symbolized by the light) and his future glorious state after death." (4) The commentator continues, saying that the presence of Moses and Elias are to be understood as verification that Hebrew law and prophecy supported Jesus and His mission. The Interpreters Bible, in the commentary on Luke’s account, stresses the close relationship between the Transfiguration and the Resurrection, stating that "the earthly life of Jesus could not be seen truly except when it was looked at from the standpoint of the Resurrection." (5) Furthermore, after the Resurrection, the disciples’ perception and understanding of Jesus’ historical life was transfigured, and they saw Him as invested with heavenly light and power. 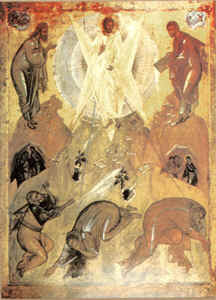 The Protestant commentator of The Interpreters Bible also views the Transfiguration as Christ’s spiritual experience of praying before His Passion, where he gained strength to face His coming ordeal, and where He experienced a vision of Moses and Elias (law and prophecy) which vindicated and validated His mission and purpose. The Interpreters Bible exegesis of Luke 9:34-35 briefly makes what we consider to be a most significant point, that the Shekhinah (manifested as a cloud) was expected to reappear in the messianic period, according to 2 Maccabees 2:8, (6) which states that "the glory of the Lord and the cloud will appear, as they were shown in the case of Moses ..." The commentator also states that Moses was the prototype of the Messiah, according to Malachi 4:5, and that they both seem to be the two witnesses of the Messiah in Revelation 11:3-12. In The Interpreters Bible commentary on Exodus 34:29-35, it is stated that "when Moses talked with God, the skin of his face shown. The Septuagint translation says it was ‘glorified.’ The light of the Shekhinah or Divine Presence was communicated to him. This account is the antitype for the account of the Transfiguration in the New Testament." (7) We will return shortly to a more extensive discussion of the role of the Shekhinah in the Transfiguration. St. Basil the Great comments that the Transfiguration is an anticipation of Christ’s glorious second coming, (10) which is the thrust of the reference to the Transfiguration in 2 Peter 1:16-18, (11) (See this footnote for the text of this passage.) and thus one of the early interpretations. Vladimir Lossky is one of the few contemporary authors, who, in explaining why Elias and Moses are present, mentions an additional reason—that it is because they both had a "secret vision of God." (12) Lossky states that he is following St. John Chrysostom in his explanation—one of the formulators of the patristic tradition of the Orthodox Church. However, in a short essay, Lossky could only barely mention this parallel in a few words. We would like to develop this last idea more fully in order to gain a clearer understanding of the meaning of the Transfiguration, and of the role of the skéné as a symbol to commemorate places where God has manifested Himself to man. I will let all my glory pass in front of you, and I will pronounce before you the name of YHWH ... You cannot see my face, for man cannot see me and live ... Here is a place beside me. You must stand on the rock, and when my glory passes by, I will put you in a cleft of the rock and shield you with my hand while I pass by. Then I will take my hand away and you shall see the back of me, but my face is not to be seen (Exodus 33:19-23). After this theophany God gave to Moses the second Tablets of the Law. Now that we have suggested why Moses and Elias appeared with Christ at the Transfiguration, let us proceed to suggest what relationship exists between the Transfiguration and the Shekhinah. After Christ was transfigured in glory, when His face shown like the sun and His garments were more brilliant than the sun, God spoke out of a bright cloud that covered the three apostles with shadow. (20) We suggest that this reference to God speaking from a cloud is a reference to the Shekhinah, because one of the two ways in which the Shekhinah was experienced in the Old Testament was as a pillar of cloud, such as led the Israelites by day in the wilderness, and resided in the Holy of Holies. (The other manifestation was in the form of fire, as when God appeared to Moses in the burning bush, and as the visible form of God’s Presence in the wilderness that led the Hebrews by night.) 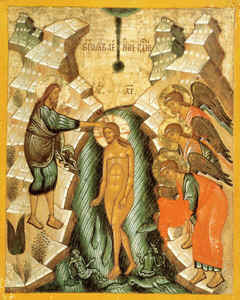 At the Theophany that occurred at Christ’s Baptism, God the Father also spoke out of a cloud (icon, above left). 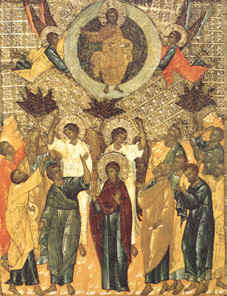 And at Christ's Ascension He ascended in a cloud (icon, above center). 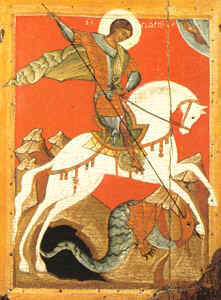 Moreover, it is a common convention in Christian iconography, inherited from its Jewish antecedents, to illustrate that an event or action occurred "by the hand of God," by depicting a semi-circular cloud in the heavens with a hand in or protruding, as, for example, in icons of St. George slaying the dragon (icon, above right). There are a variety of different manifestations of the Divine Presence that constitute the Shekhinah. They are: the invisible Presence that dwelt between the Cherubim over the Ark of the Covenant in the Holy of Holies; the visible pillar of cloud and fire; the burning bush; the cloud out of which God spoke at the Theophany (Baptism) and Transfiguration, and the cloud of the Ascension, etc. ; plus the possibility that the Uncreated Light of Mt. Tabor may also be a manifestation of the Shekhinah. What is the relationship between these different manifestations? In addition to the appearance in the form of a cloud, according to the just mentioned essay on the Shekhinah, there is another prominent image associated with the Shekhinah—that of light, radiance and glory. (25) Let us attempt to apply this most elucidating concept. Obviously, fire is a very concentrated form of light. When Moses came down from Mt. Sinai after conversing with the Lord, his face was so brilliant and radiant that the people could not bear to look at him. On Mt. Tabor, Christ shone with such a radiance and glory brighter than the sun, that the apostles could not bear to gaze directly at the sight. In the theophanies to Moses and Elias discussed above, where the Glory of the Lord passed by, the visible (to some) Divine Glory may well be understood as being one aspect of one type of manifestation of the Shekhinah. There are countless references to "glory" in the Bible, as well as throughout hymnography, and in prayers—such as the Glory that filled the Temple, or the Glory of the Lord that shone when the angels proclaimed "Christ is born! ", plus all the references of ascribing glory to the Lord and to the Holy Trinity. Might there be an underlying ordering principle which could unify the complexity of the experiences of the Divine Presence, the Shekhinah? I propose that perhaps the cloud, fire, and created light may be understood as grosser, more corporeal manifestations, closer to the material existence of the world, and that the Glory of the Lord witnessed by Moses and Elias on Mt. Sinai, and again on Mt. Tabor when the Glory of the Uncreated Light surrounded Christ as He was transfigured, is a more rarified, less corporeal form of the Shekhinah. In attempting to understand the nature of the Shekhinah, we find that it is integrally connected with the meaning of the skéné. Furthermore, as we commented in Footnote #2, mishkan, Shekhinah, and skéné are related etymologically by means of the common "s k n," and the linguistic involvement with the "tent." But, I contend, they are related linguistically precisely because their natures are related: they each reveal the Divine Nature and Presence. The mishkan/skéné provide the place wherein the Shekhinah may dwell and be among mankind on earth. 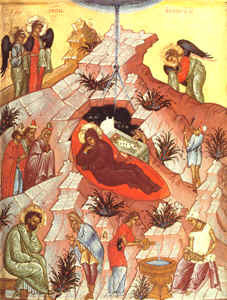 The New Testament declares that Christ Himself is to be regarded as the divine skéné — as the Temple or Tabernacle of God — within whom the Shekhinah dwelt among mankind on earth, as indicated in Revelation 21:3 — "Behold, the Tabernacle (skéné) of God is with men, and He shall dwell (tabernacle or skénósei) with them" (AV). The author of Hebrews presents a similar understanding of Christ’s nature. Hebrews 8:1-2 says: "We have such a High Priest who sat at the right of the throne of the majesty in the heavens; a minister of the Holy Things, and of the true Tabernacle (skéné) which the Lord pitched, and not man." The writer is making an analogy between the high priest who is a minister of the Holy Things in the earthly tabernacle, and Christ, the High Priest, who is a minister of the Holy Things in the True Tabernacle in heaven. Continuing this theme in 9:11, the author also states that Christ is the High Priest of the greater and more perfect tabernacle (skéné) not made by hand, and not of this creation. 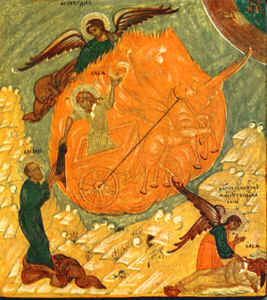 That there is indeed such a close and significant interconnection between the skéné martyríou—the Tent of Meeting or Witness—and the Shekhinah Who dwelt there, and Christ as the skéné within Whom the Shekhinah dwelt (as is revealed in the Transfiguration), is made clear in the Prologue of St. John’s Gospel, where he says: "....and the Word became flesh and tabernacled (eskénósen) among us (or "pitched His tent among us"), and we saw His Glory...." (John 1:28). (28) (Please read this footnote for further comments about how this vital phrase is translated into English.) In other words, Christ's body is a skéné that dwelt on earth, through Whom the Shekhinah was made known. In his essay on the "Shekhinah" in the New Catholic Encyclopedia, Burtchaell states that John 1:14 is a clear reference to the Tent of Meeting." (29) In that skéné / Tent of Meeting, the Glory of the Lord was made visibly manifest and experienced under the name of Shekhinah. The New Testament maintains that Jesus Himself is a skéné, a Tabernacle, in Whom the Glory of the Shekhinah is likewise visibly made manifest. However, at the Transfiguration, when God spoke out of the Shekhinah/cloud (perhaps a lower vibration of the Uncreated Light), Peter realized that he was totally missing the point to think about grass and twig huts. Does one construct a puny man-made skéné, when the divine skéné Himself in all His Glory is made manifest before one’s very eyes? In conclusion, we sought to demonstrate in this study how prominent is the Old Testament presence in this New Testament event of the Transfiguration: the presence of the Shekhinah; the presence of Elias and Moses; the presence of the Septuagint translators in their choice of skéné for rendering mishkan, and the consequent impact of that decision on New Testament theology; and the presence of the Old Testament experience that a skéné/mishkan is where the Glory of the Shekhinah is made manifest. (1) Skéné is a Greek word, whose oldest and primary meaning is "tent." Another ancient use of the word is to designate the wooden or stone stage, or stage building, and "scenery" back-drop where actors performed in the ancient Greek theater. (Our words scene/scenery remind us of this early meaning of skéné.) Later meanings include: booth, tabernacle, dwelling-place, temple, and canopy-like covers. These later meanings seem to be a result of the Septuagint translators’ choice of the Greek word, skéné, to render three different Hebrew words when the Hebrew Bible was translated into Greek during the third-second centuries B.C. The first of those three Hebrew words is ‘ohel, the characteristic term for tent, and the only one that we would normally expect to be rendered as skéné in Greek. The second Hebrew word is sukkah, which means "booth." This is the word used in the Feast of Booths (or, sometimes called the Feast of Tabernacles), where "booths" refers to the grass and twig huts constructed annually to commemorate the forty years wandering in the wilderness by Moses and the Hebrew people, when the Tabernacle was a tent, and the people lived in tents. The third Hebrew word translated as skéné is mishkan. This is the most interesting translation, because the Hebrew word means "tabernacle" or "dwelling-place," connoting a permanent dwelling, whereas a tent connotes an impermanent structure. In Kittel’s Theological Dictionary of the new Testament. Vol. 7 (Ed. by Gerhard Friedrich and Gerhard Eittel, Trans. G.W. Bromiley, Eerdman Publishing Co., Grand Rapids, Michigan, 1964), the author proposes that the reason that the Septuagint translators chose skéné as the natural, inevitable word-equivalent of mishkan is that they both contain the same three consonants, s k n, in the same sequence. Consequently, the meaning and use of the word skéné in the New Testament is shaped and molded by its antecedents in the Septuagint. (2) The Hebrew word, Shekhinah (sekina), which became a substitute for the Holy Name of Yahweh, is an important term for understanding the biblical conception of the nature of God. Shekhinah signifies all the awesome, mystical, Power and Holiness of God's Presence, especially as localized in the Holy of Holies, first in Moses’ Tabernacle in the wilderness, and later in the Temple in Jerusalem. The word is derived, interestingly, from the Hebrew root, sakan, meaning "to pitch a tent," which is the same root from which mishkan (the most common Hebrew word used to refer to the Tabernacle of Moses) is also derived. Furthermore, Shekhinah has the same three consonants, s k n, as does mishkan and skéné (the Greek word usually chosen to Translate mishkan). (9) Ouspensky and Lossky, op. cit., pp. 107 and 142f. (in Lossky's essay on St. John the Forerunner, and in Ouspensky's essay on St. Elias). (18) In this discussion we have been referring only to icons of the Transfiguration, because little else exists, particularly from the early centuries. The feast of the Transfiguration and its theology is basic to the theology of the icon, and hence, holds a prominent position in Eastern Christian theology, spirituality, and liturgical life. Contrariwise, few portrayals of the Transfiguration exist in western art, for the feast enters little into Latin Western Christian consciousness. In fact, as mentioned in the next footnote, the feast's observance was not universal in the West until 1457, and then, its observance was for political, not theological reasons. (In Western practice the Gospel for the second Sunday in Lent has long been an account of the Transfiguration.) Yet this neglect of the feast is entirely consistent with the West's rejection of icons and their accompanying theology. 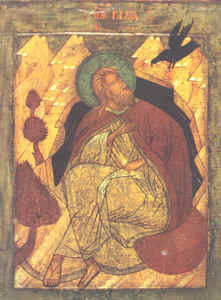 The theology of the icon was given systematic formulation largely during the eighth-ninth centuries’ iconoclastic controversy, and was endorsed formally by the Seventh Ecumenical Council in 787. The decisions of this council were rejected by Charlemagne for several reasons. A strong iconoclastic tendency has remained prevalent in Western Christianity, and received vigorous expression in the sixteenth century and later. 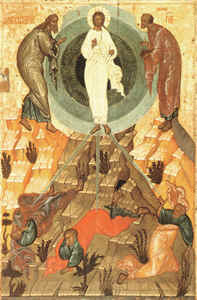 There are only three extant early representations of the Transfiguration. The oldest dates from the fifth century Baptistry in Albenga, on the Ligurian coast, in northwest Italy. It is a symbolic portrayal, showing three concentric circles, which are like inundating waves of glory, emanating from a giant Chi-Rho (XP). The second is from the time of Emperor Justinian and the Monophysite controversy. It is an apse mosaic from 549 in Sant’ Apollinare in Classe, in Ravenna, Italy. This stylized mosaic portrays Christ in glory, with Moses and Elias (depicted from the waist up only), surrounded by clouds, with the hand of God in the midst of the clouds. The three Apostles, Ss. Peter, John and James, are represented by three sheep.